Have you experienced similar like shown on the photos? I have brought a new Cabrinha Contra 17 kite and after the first use I have noticed that a lot of sand and small stones have stuck behind the canopy where it meats the leading edge. Closer inspection showed that there is a glue tape between the edge and canopy and it has started to separate. The exposed glue is very sticky and it collects the small stones. "I have reviewed this with out Kite Designer & Production Manager. This is the area that the canopy meet the leading edge. 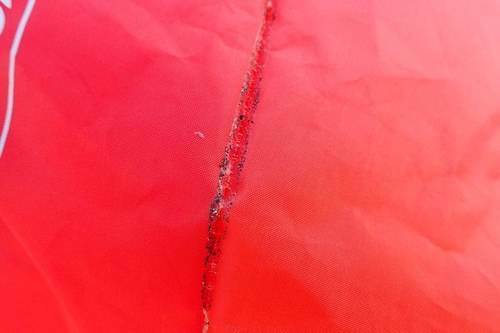 To make sure that the canopy is sewn on the correct place of the leading edge without twisting there is a double-sided tape that is used to keep it in place during the sewing process. This tape is only critical during the sewing process. The glue that you are seeing is from this tape. Some times when you pull the leading edge like that you will expose the tape. As the canopy is sewn to the leading edge, there is no risk at all with this tape being exposed. This will not affect the performance of the kite, it is not a manufacturing or materials defect so we are denying this claim." "I´m sorry, but that is all i can tell you. The technique is is the only how cabrinha, and all other brands as well, way for them to properly connect the fronttube to the sail. I´m sorry that the quality of cabrinha does not suit your standards of quality. If cabrinha says, that it´ll not affect the performance of the kite, you can believe them. You can just clean up the area. The glue will wear off and less sand is gonna stick to the area." Well... I can accept that this is not an issue for the performance but I think it is a manufacturing fault. Very disappointing. When I have bought this kite for a lot of money I was expecting a high quality kite not a cheap "made in china" product. Or do I expect too much? Is Cabrinhas really like this? Have you guys had similar problem with your kites? How did you clean up the area? I am really worried that the kite material will chafe through because of the small stones. But this glue is super sticky not something easy to clean. Hesitant to use any solvent because afraid that it might attack the material itself. I totally concur with you mate. 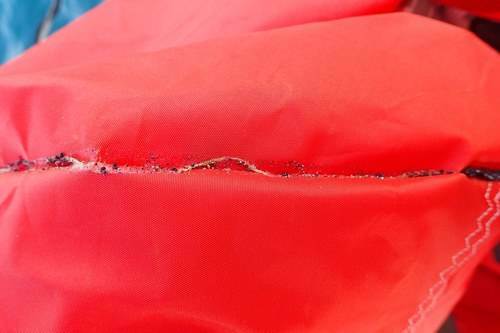 A brand new kite should not do this, and the sewing should have been ample or wide enough to stop the two sections separating, so as to not expose the glue. I sew and repair kites myself, and I too use doubled-sided tape to keep the sections together when sewing, but I remove the tape afterwards, and the only way to do that is to pick it out! Or what they could do is "hotsew" the sections with a quick iron press or even an a single-hole sew and then sew OVER the top of the middle run, then pull the middle run out. But the question begs: how/why did you get to separate the two apart? Yeah I would remove as much grit and crap in there as much as possible. Enough grit could collect to damage your kite or worse puncture the leading edge and POP you've got a useless kite in the bin or a very expensive repair. Get a sail maker or repairer to resew the sections down. Alchohol will remove the glue and the grit too without damaging the canopy. You can get a box of 100 alchohol swipes for $20 at chemists or ebay. All I did is inflate the kite, fly the kite, deflate the kite, washed it at the beach. At home I have noticed that dirt and rocks are falling from the kite. That's when I have noticed the separation. As it can be seen from the photos the 2 parts are not everywhere have been separated yet. Would you separate them to remove the glue? Or remove the glue exposed after each session? dont put dirt and rocks in your kite? Don't wash your kite ether! Lol. Yes, of course! Unfortunately there is no grass or clean surface where I inflate/deflate the kite. I've got the the 15M Contra and have been riding it for awhile. I have No Probs with it at all. It sounds like someone has done something to it. if you bought it from a shop take it back and talk to them about it. Warranty only lasts 1 year.I've been riding Cabs for over 4 1/2 years and have never had a problem with them. BTW most Kite brands make their Kites in China.